Spiced with traditional festive flavours, homemade bread. Confit apples, Dijon remalaide and a sloe gin glaze. Homemade tartare sauce, lemon oil dressed rocket, farmhouse slice. Oven roasted, confit tomatoes, black olive crumb, basil infused oil. sausage meat stuffing, cranberry stuffing, honey glazed parsnips, pig in blanket, traditional roast potatoes and a stock gravy. Five bean cassoulet, tenderstem broccoli, dipping bread. Slow braised beef with roasted root vegetables in a red wine and garden herb gravy. Baby spinach, tenderstem broccoli, caper popcorn and a citrus cream sauce. Rustic and hearty, dipping bread. All of our mains are served with fresh seasonal vegetables and herb buttered new potatoes. 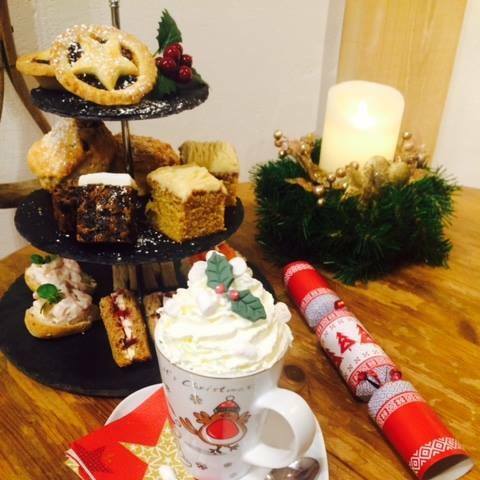 Please ask for our selection of festive desserts. In addition to the above Specials we will of course be serving our regular Menu featuring: Breakfasts, Delicious Hot Meals, Light Bites, Afternoon Teas, Snacks.... and of course our Famous Homemade Cakes.